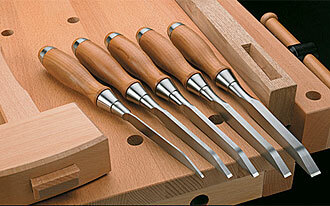 These are substantial mortise chisels. The blades are more than 12.7 mm thick at the heel of the bevel and are a consistent width from tip to shoulder for accurate registration in a mortise. 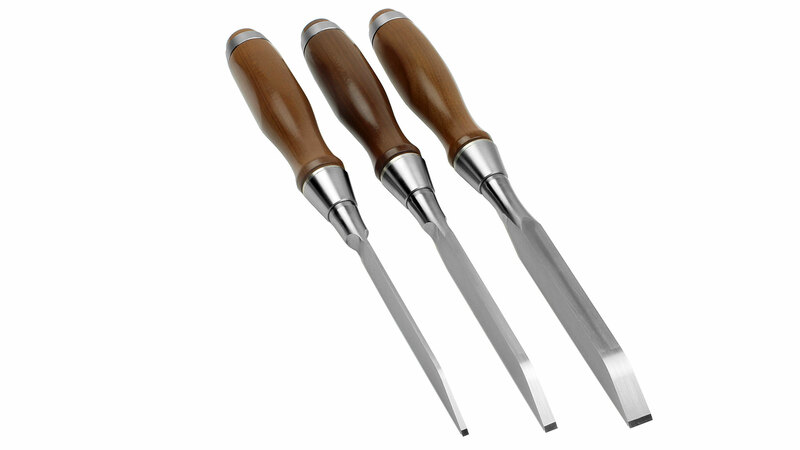 The chisel sides are slightly relieved to reduce sidewall friction and allow for minor cut corrections. 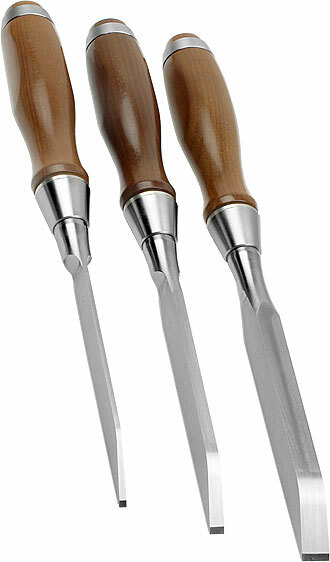 Each has a 25° primary bevel to make deep cuts easier, with a 35° secondary bevel to give them a durable cutting edge. To aid in levering out waste, the heel of the bevel is rounded to provide a smooth fulcrum. The blade-to-handle connection is made with a tang and a socket-like ferrule. The tang has flats to prevent the handle from rotating. Turned from a solid blank, the ferrule seats directly onto the shoulder of the blade. The hard maple handle has been torrefied, a heating process that changes the structure of the wood at the cellular level, stabilizing it against swelling and shrinkage caused by humidity changes. The handle is contoured to fit the hand nicely, with shallow flats parallel to the blade sides to provide tactile cues for blade alignment and finger placement. The end is domed and has a stainless-steel hoop to resist chipping and deformation from mallet blows. Overall lengths range from 295 mm to 311 mm; blade lengths (including bolster) range from 138 mm to 159 mm. Only final honing is required before use. 5/16 inch 7.9 mm Currently not in stock! 1/2 inch 12.7 mm Currently not in stock!